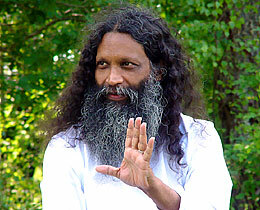 Swami Santhiprasad's final spiritual Yoga Master. was born in February 1, 1928. His father was Padmanabha Pillai, a man of truth and honesty. After his secondary school education he joined the Indian Army and had undergone the experience of war twice. This had intensified his spiritual search which was there in him all along. He became a great devotee of Mother Goddess Adi Parasakthi. He was doing Devi Upasana at late nights while all his colleagues were sleeping with out any one in the higher ups noticed it, as it was against the practice in the Army to remain awake at resting time. He very often has had the vision of Mother Goddess Mookambika during this period. 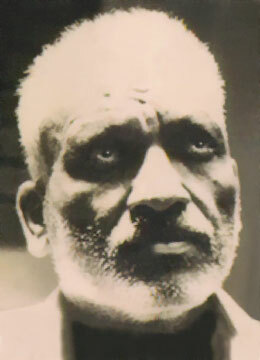 After his retirement he served the Maha Raja of Travancore as his driver. While he was living in Mangalore in connection with his job, he continued his usual night long Sadhana. He used to integrate within himself and remained in the unified state of consciousness every time he was meditating. He felt the presence of Mother Goddess wherever he went. He converted the biggest room in his small house as the temple for Mother Goddess where as his wife, three girl children and ill stricken father-in-law where staying in utter congestion. Mother Goddess was his first choice in his life. Whatever he offered, especially the Kumkum and sacred ashes were felt received by Mother Goddess with profound satisfaction. In meditation he understood that the Universe was evolved and will be submerged as a big pulsation! He was simply following the guidance of the Mother Goddess as a completely surrendered Devotee. All the great Masters of the bygone era such as Kola Maharishi, Buddha, Jesus Christ, Mohammed the Prophet, Adi Sankara were all living entities for him. He felt their presence all along. Bhaskara Pillai Swamikal had identified all the subsidiary psychical energy centers which according to him are divinities and Masters. Swamikal explored the hidden and forgotten areas of spirituality, which were once in vogue among the great Saints of ancient times. Swamikal was always alert day and night. No one had ever seen him sleeping. With his great alertness he could see the divine pulsations flowing through his channels and chakras. He had elaborately studied the science of pulsations. According to him absolute alertness is what an aspirant needed for spiritual evolution. Swamikal had no personified Master. His Master was the consciousness itself. He was a man simple to the core. He had never shown any signs of extraordinariness. He was neither looking for fame nor for money and also never wanted people to follow him. that even people who were very near him didn't know the depth of his knowledge. He used to say to his disciples that his pooja and dhyan are for the welfare of the Universe and for the existence of divinities. The first disciple of Swamiji was Raja Atma Ram who introduced Swami Santhiprasad to Swamikal and he in turn introduced Shri. Kanaka Raghavan and Shri. Raja Mohan. Mauro Benati, the healer and Anjela Vindigni, Yoga expert are the very few who got personal contact with Swamiji. Swami had his wife daughters and two grand children. A week before his Maha Samadhi he had the vision of Adi Seshan coming near him and had taken him to his abode. Swamiji was waiting for his disciple Santhi to come from Europe to do his last rights. On January 4, 1999 Santhi arrived in Trivandrum and visited Swamiji at night. The next morning on January 5, 1999 after his usual morning duty of dropping children to school he sat down at 9.40 and left his mortal abode.